There’s one last recipe to share before Thanksgiving Day. Today, we’re going to “real foodify” another classic American Thanksgiving side dish: sweet potato casserole. Growing up, I thought sweet potato casserole could only be made one way–the marshmallow way. The sweet potatoes that sat under the baked marshmallows were just part of the casserole; not the main star. 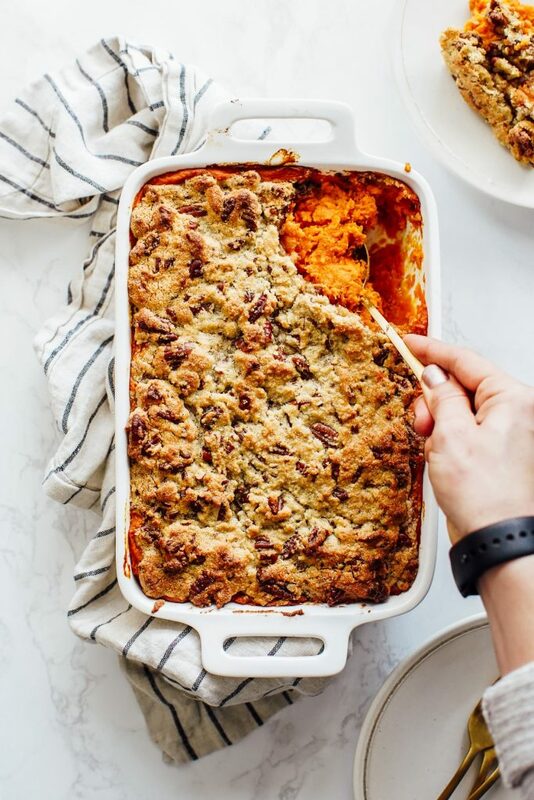 My first experience with a different variation of sweet potato casserole wasn’t until my early 20’s when I attended my first Thanksgiving with my husband’s family. I remember looking down at the sweet potato casserole that sat in front of me at his grandmother’s table, and thinking what a travesty it was to not include a pillowy layer of marshmallows on top. Nuts? What is this? Why? Where are the marshmallows? I did try the sweet potato casserole that way, and was actually quite smitten with the nut-topping version. 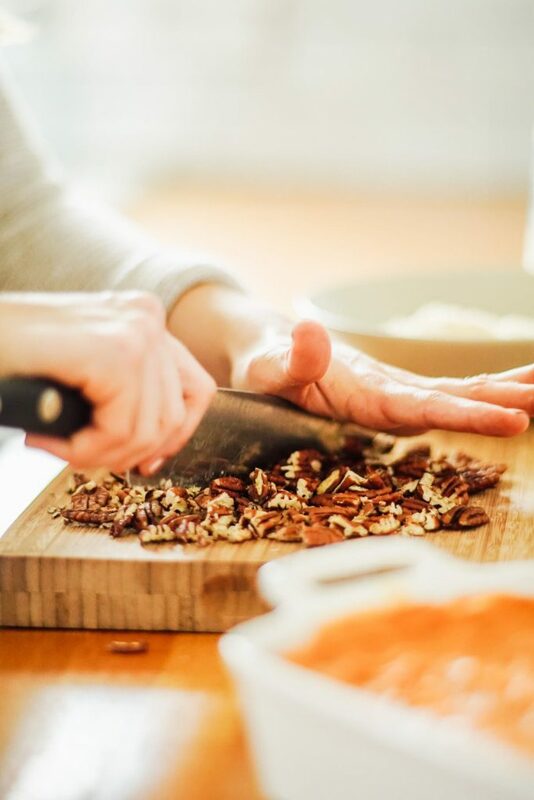 Since that time, I’ve learned that sweet potato casserole, along with a variety of classic Thanksgiving dishes, can be made in a variety of different ways. Today’s recipe doesn’t call for marshmallows, but it does call for a nutty topping. Don’t tell my mom, but I actually prefer the nut topping now over the marshmallow version. 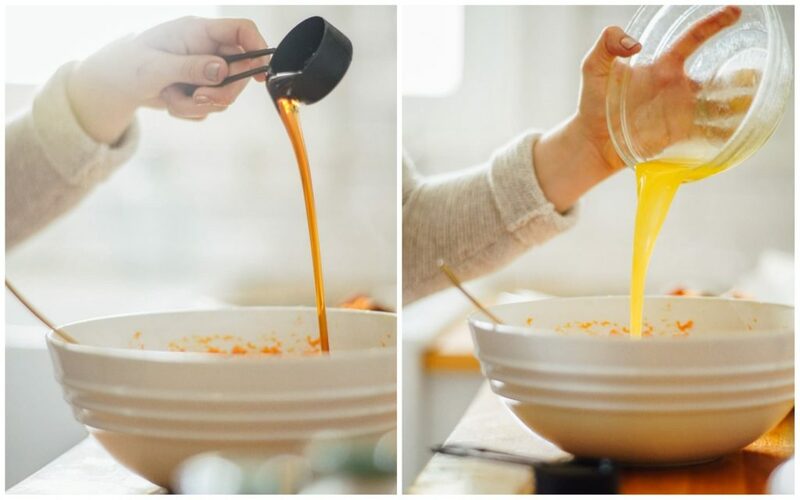 I find the marshmallow topping is far too sweet, particularly if you add a ton of sugar to the sweet potato mixture–as most recipes require. This recipe is a remake of a recipe that’s been passed down in Chardea’s family. (Chardea works with me on computer projects and recipe testing.) The traditional recipe calls for a TON of sugar. The mission of reworking her family’s favorite recipe was to reduce the amount of sugar without compromising the taste. I must say, we did an excellent job at achieving this goal. Both her mother and mother-in-law were delighted with the changes we made. Mission accomplished! Our “real foodified” casserole starts by roasting (versus boiling) the sweet potatoes in order to bring out the natural sweetness in the sweet potatoes. 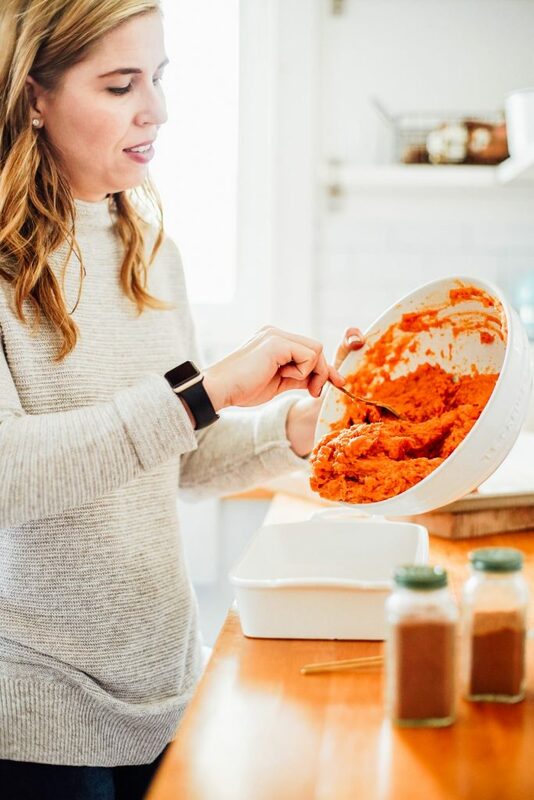 After roasting the sweet potatoes, the flesh is scooped into a bowl and then combined with a handful of simple, real ingredients: maple syrup, warm spices, butter, and a natural binder (egg). Once the casserole filling is made, it’s time to make the topping: almond flour, pecans, maple syrup, and butter. That’s it! 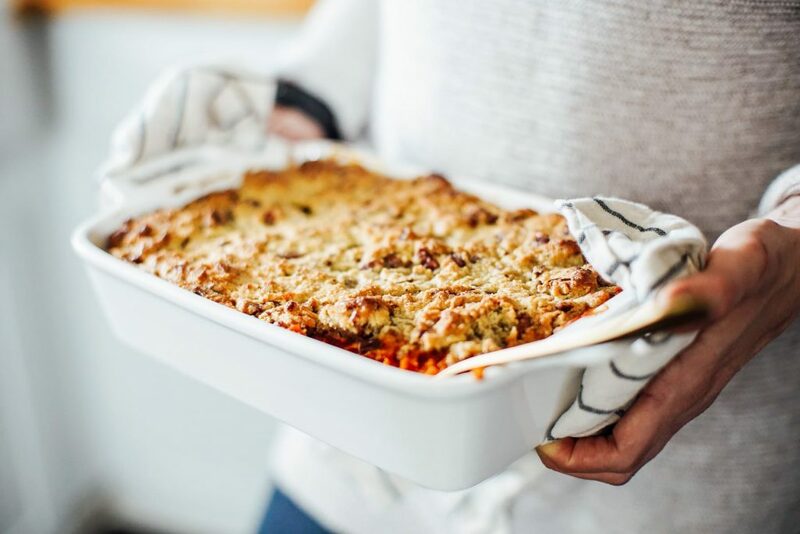 The topping is spooned over the casserole and then baked until the nutty topping is slightly brown and toasty and the sweet potato layer is warmed through. The star of today’s recipe is the sweet potato filling. 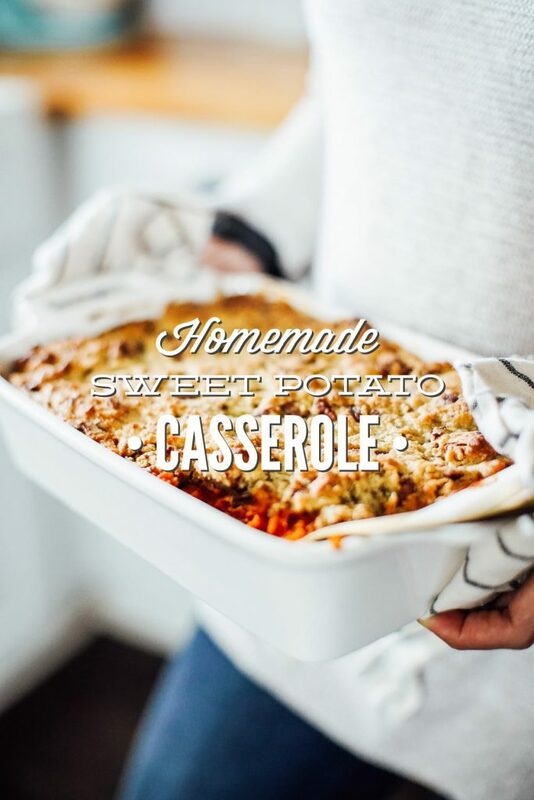 Sure, the topping is delicious, but the sweet potatoes really shine through in this casserole–as they should. 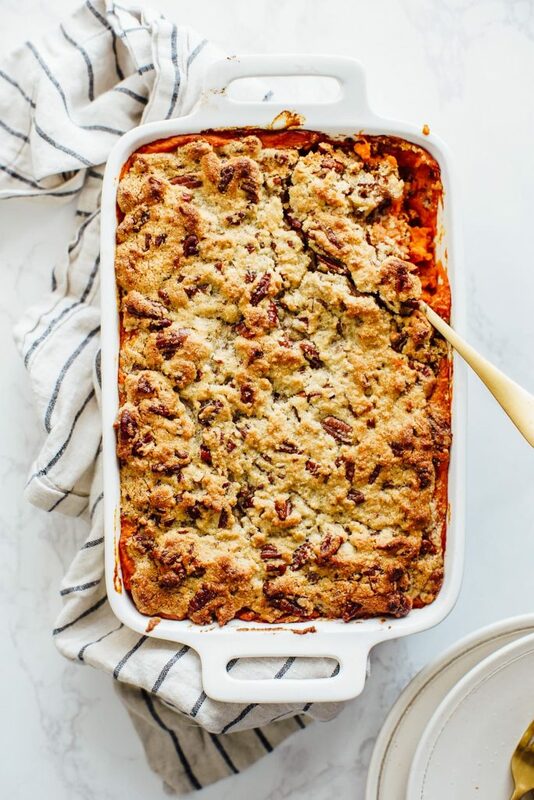 A homemade, real food-style, naturally-sweetened sweet potato casserole with a gluten-free topping made with almond flour and pecans. Preheat the oven to 400F. Cut the sweet potatoes in half, lengthwise. Place the potatoes on a rimmed sheet pan that's been lined with parchment paper. Drizzle the potatoes with 1 tablespoon of oil, and then rub the oil on the flesh of each potato. 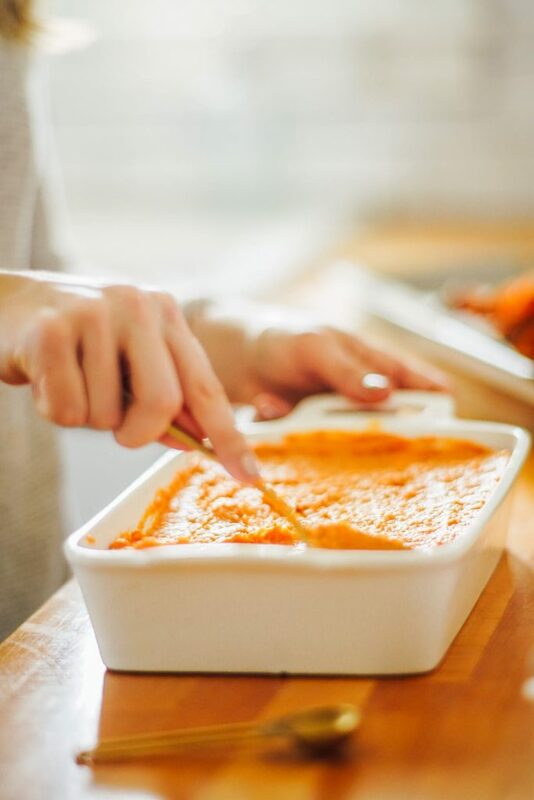 Bake the sweet potatoes, uncovered, for 30-35 minutes (this will depend on the size of the potatoes), until the skins begin to look shriveled and soft. Remove the potatoes from the oven. Set the potatoes aside, on the sheet pan, to cool for 10-15 minutes until they're easy to handle. 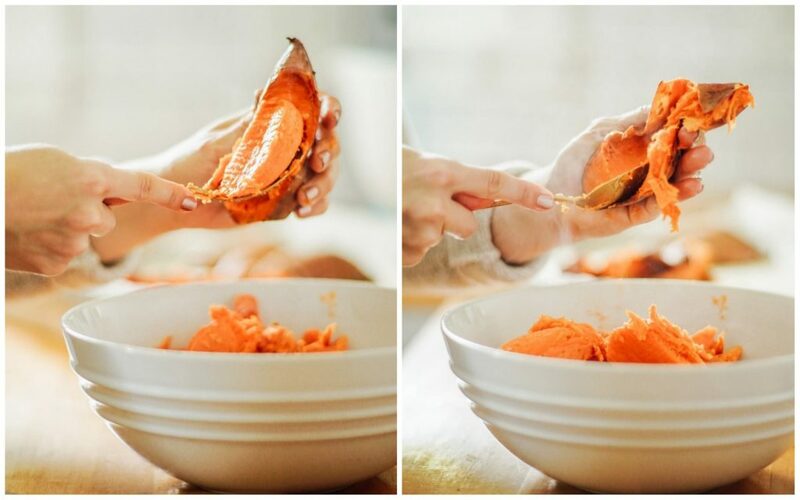 Scoop the sweet potato flesh from the skins into a large bowl. Discard the skins. Mash the sweet potatoes using a fork or potato masher. They should be very easy to mash. Add the remaining casserole ingredients (not the topping ingredients) and stir to combine. 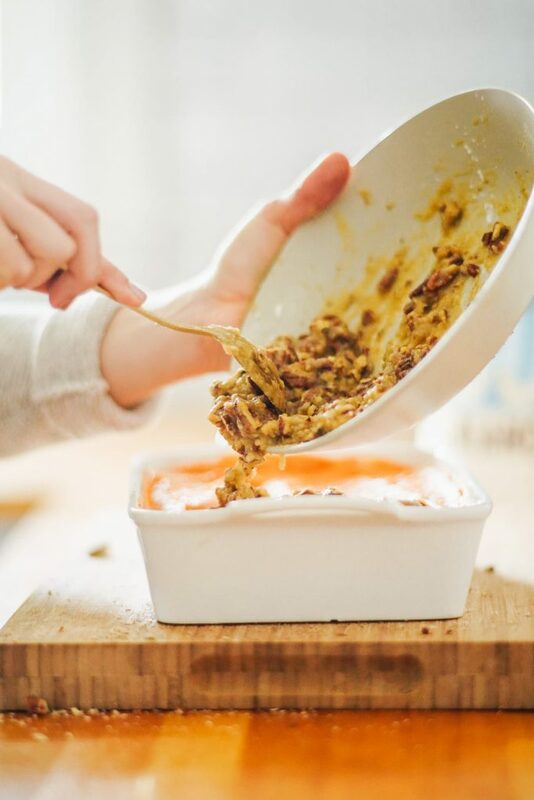 Spoon the casserole filling into a small casserole dish or baking dish (my baking dish is 10.5x 7--like this). 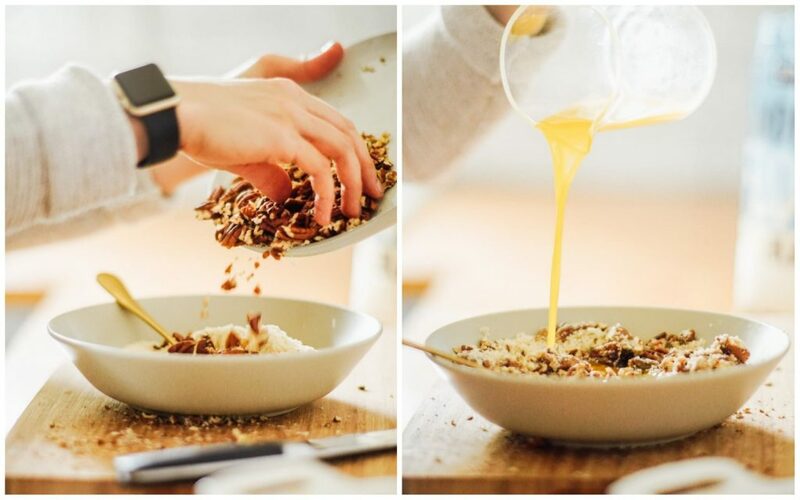 Whisk together the topping ingredients: pecans, almond flour, starch (optional*), maple syrup, melted butter, and a pinch of the seasonings (salt and nutmeg). Spoon the topping over the casserole filling, carefully spreading the topping over the filling. If you find this is hard to do with a spoon, try using your fingers. If you want more topping (a thicker layer) try making 1.5 times the topping recipe here. This will provide a very thick layer for the casserole. Bake the casserole, uncovered, for 25-30 minutes, in the center of the oven, until the top is golden brown. 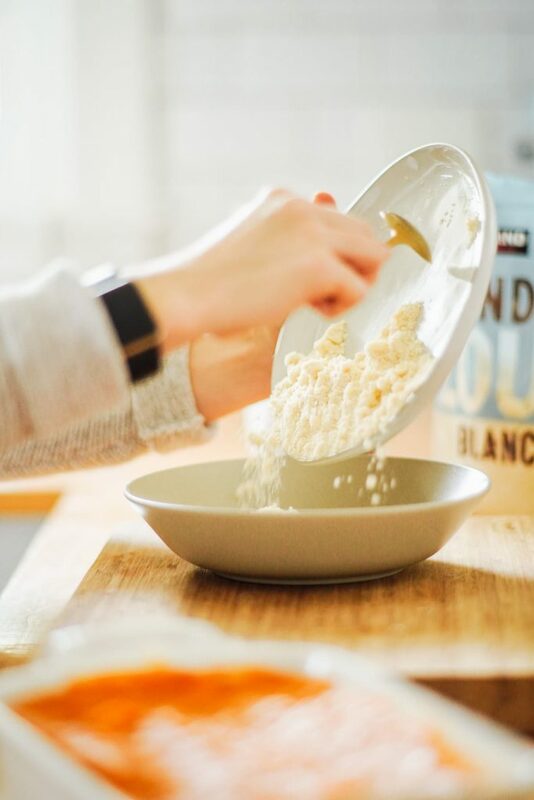 You don't want the almond flour topping to burn, so if you find it's getting too brown, change the position of your casserole in the oven or reduce the oven temperature to 350F. Without the arrowroot, the almond flour topping can be a bit moist in spots, even after baking. I personally don't mind this. I actually like the texture. If you'd like a crisper topping, add the starch (or try cornstarch). Thanks for sharing this recipe, Kristin! I am going to try it this week for Thanksgiving! 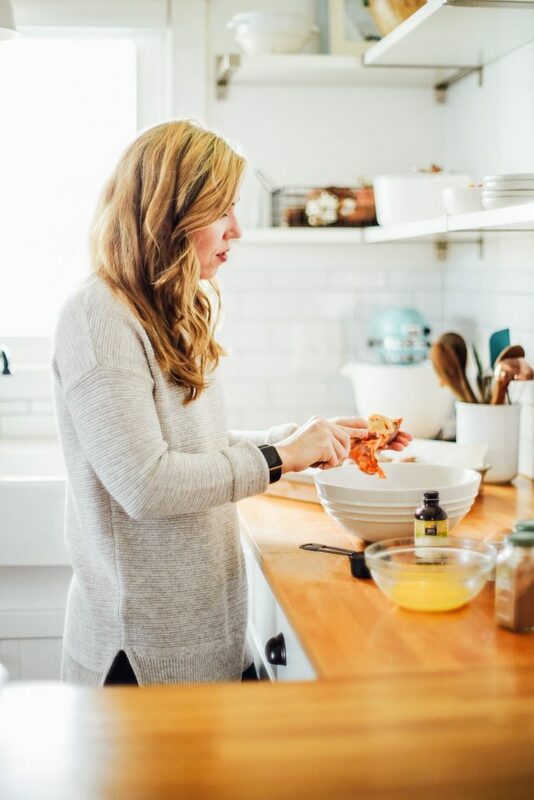 I always love your recipes – I swear our tastebuds must be the same because everything is always perfect for me! Anyways, quick question – I am making this for a larger group and plan to use a 9×13 glass dish. Do you recommend a straight doubling of the recipe or…? Also, since my dish is glass, not ceramic, what are your suggestions on potentially needing to adjust the cooking temperature and time? Many advance thanks! 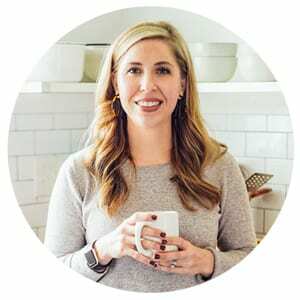 Hey Deirdre, I’m so glad you’re loving the recipes :). I haven’t tried doubling this recipe, but my thought is it should work. 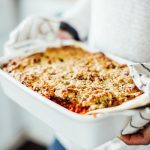 Another option would be to double the recipe, but just make two separate casseroles (hopefully that makes sense–trying to think how best to word that). For this recipe, I don’t think you’ll need to adjust the time for the glass, but I would keep an eye on it while cooking through the oven door, just to make sure it doesn’t look like it’s cooking too quickly. If that’s the case, pull it out when the top is brown and the sauce is bubbly. Love this as well!! Why do people make these perfectly sweet potatoes into candy and something unhealthy? I have always liked the plain roasted version and this is perfect for Thanksgiving. I know this isn’t as healthy but could you sub the almond flour for regular flour or whole wheat flour to keep costs down? Hey Ashley, You could. It won’t result in the same flavor or texture as almond flour. I mainly used almond flour for the taste and texture.